VI Monitor is a video management system app that allows authorized users to access live and recorded video from any camera on any server. Users can view and control PTZ cameras, view full resolution and high frame rates with H.264. The app imports all settings from a single address providing users access to individual cameras or in groups of cameras in pre-defined views. Users can save, email snapshots, or export the snapshot into iPhoto. 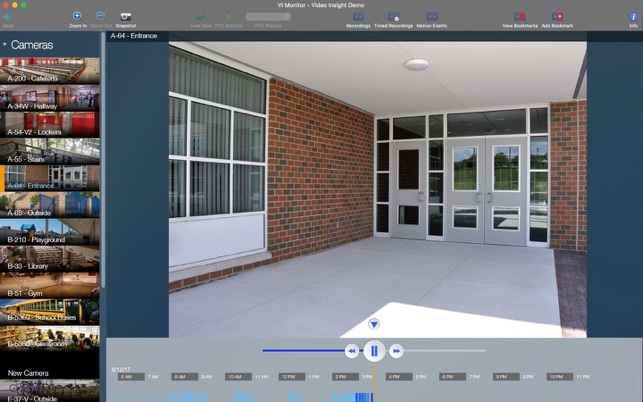 View recorded video by selecting a video file, a specific time, or a motion event. 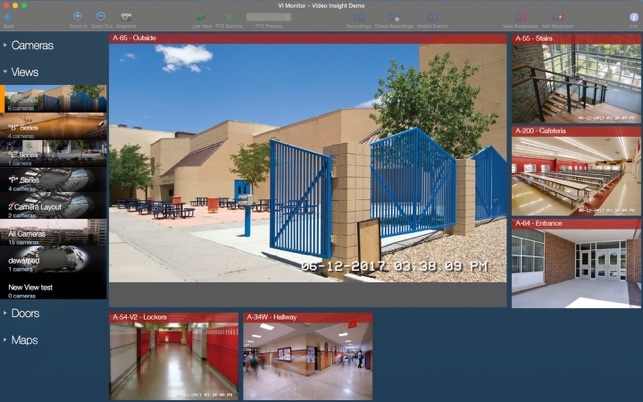 View facility maps with the location of your cameras, embedded views, and embedded maps. User access is controlled by the Video Insight Server with robust integration with Active Directory/LDAP users and groups. 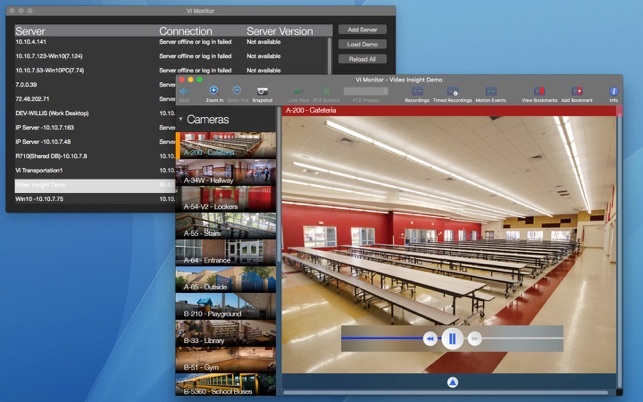 - Import a server's cameras, maps, and layouts with just one IP address. - Support for private and public IP addresses. - View server statistics such as CPU and memory utilization, used disk space, available cameras, serial number, and unique ID. - View current connection and server version for all your servers at a glance. - Reload all servers or one particular server at the touch of a button. - View live cameras in layouts of up to 36 cameras. - Stream MJPEG, MPEG4, and H.264 video. - Save a video snapshot to as an email attachment, as a file on your system, or export it directly to iPhoto. - View camera information such as frame size, frame rate, last read and write times, network bandwidth, codec, and camera model. - Select recorded video files or motion events for a specific day, month, or year range. 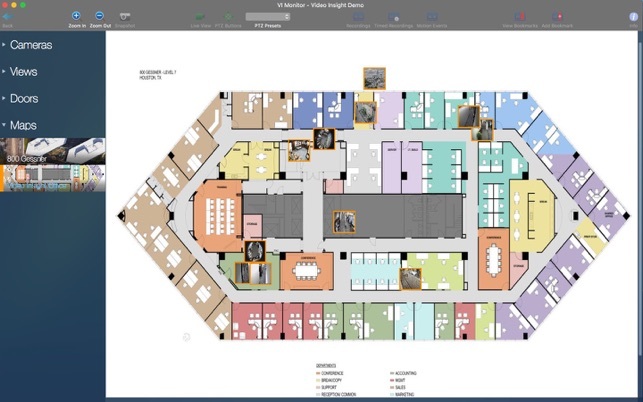 - Facility maps with thumbnail links for cameras, embedded layouts, and embedded facility maps. - Layered user interface gives the user a sense of depth and hierarchy when going from one element to the next, i.e. : when going from a live video to a list of recorded videos for that same camera. - Cameras, maps, and layouts are organized into collapsible sections for convenience. - Cameras, maps, doors, and layouts are easily distinguishable within their respective section lists by displaying large image thumbnails. 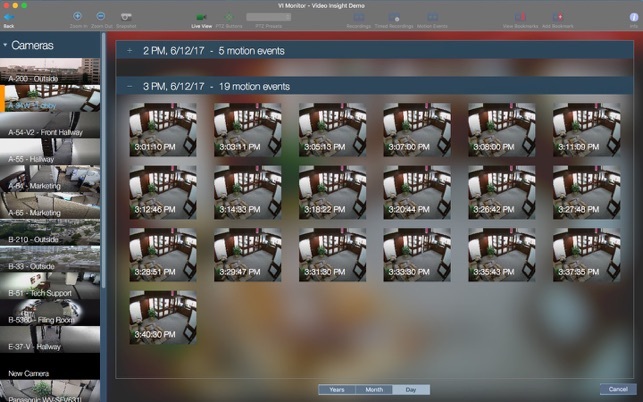 In the case of layouts, the layout cell will cycle through thumbnails for all cameras in that layout when the mouse pointer hovers over the cell. - Access control lets you view a the current status for a door, lock, and unlock the door, view user entry and alarm history, and view a map with the door and its camera. - Create your own views by dragging cameras, views, doors, and maps on your desktop. Then save them to access them at a later time or set them up to open automatically when the app starts. - Create QuickTime videos clips from live video. REQUIRES version 5.5 of the Video Insight Enterprise Server. Some features require Video Insight Enterprise Server 7.0.0.45 or newer. the description indicates that it can do camera tours, however I cannot figure out how to do this. there is no documentation of this functionality in the user guide and when I tried to contact tech support, my e-mail was bounced as undeliverable. seems pretty user unfriendly, would definitely benefit from some updated documentation of features. I’ve been waiting for a while for a Macintosh version. I’m very happy that it has arrived. I was getting tired of using VMware Fusion to run Windows, just for the sole purpose of running the windows version of this software for our security personnel. Thank you VideoInsight!